Lately I have started having one amla per day. Normally I have raw amla. This week when I shopped for it I brought more. So before it would get spoiled l wanted to use it. So decided to make pickle. We use only tomato pickle at our home that too from my mum. 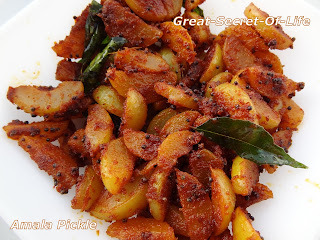 Sometime use mango pickle from my MIL. At most I do only Raw mango instant pickle (simple one) So this is my first attempt at any type of pickle.. It came out pretty well. Bring two cups of water to boil. Add the whole gooseberries along with little salt and turmeric powder. Allow to cook for five minutes. Then switch off the stove and close the vessel with lid. Let it stand for few more minutes. Drain gooseberries from the water. Remove the seed using knife and slice gooseberry into lengthwise. Sprinkle salt, red chilli powder and asafotida powder and mix well. In a kadai put a teaspoon of oil and fry fenugreek seeds lightly. Remove and powder it. Same kadai pour the remaining oil and when it is hot add mustard. When it splutter add Curry Leaves. Fry for 30 sec. Add the gooseberry pieces and stir well. Stir fry for few seconds. Finally add the fenugreek powder, mix it once again and remove. It stays good for two to three days.